This new version of Corel Painter is here – gaining a fantastic set of Thick Paint tools to add to its already impressive list of brushes. 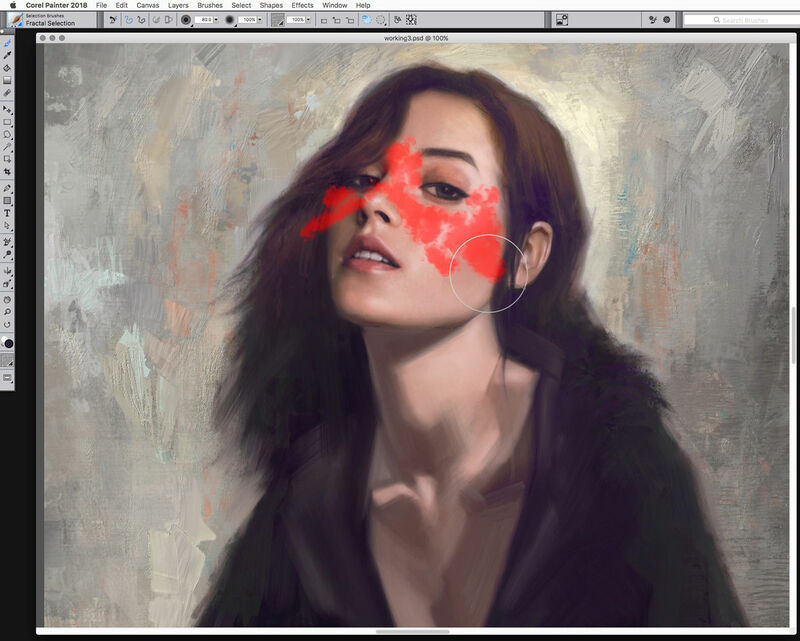 This, along with a range of other new tools and enhancements, make Painter 2018 one of the best versions yet, says artist Tom Bagshaw. So, where you’re an existing user wondering whether to upgrade or painting in Photoshop or another tool – or work with real world paints and wonder whether digital painting is for you – here’s a run down of the latest additions to one of the best tools out there. Thick Paint is Painter 2018’s ‘big new feature’ – and I’m guessing one that’s going to bring in the most upgraders and new users. This – as the name suggests – allows you to paint with pigment and volume that reacts like traditional paint. You can scrub, push, scrape and build up paint using your stylus – creating realistic depth in each stroke. Thick paint also reacts to canvas texture, so you can apply paint that will build up in the grain and can be scraped off to reveal as much texture as needed. The new Thick Paint category includes tools that will be very familiar: bristle brushes and palette knives that react with your stylus’s tilt and rotation, dynamically changing the angle of the brush mark. The ridges in these paint marks can be adjusted with controls over canvas texture, lighting strength and direction – and shadow depth – with the settings giving you a great deal of control over the depth of your work. Piling up and scraping back layers of paint with the new Thick Paint Palette Knife. There’s also a new Thick Paint loading shortcut that allows you to quickly and precisely set the brush loading on the fly and a nice visual cursor to shows the amount of paint being loaded and its colour. The properties bar also displays a new dropdown to select your painting technique from Thick, Dry, Soft and Thin. Each changes how the brush responds to the canvas along with more recognisable settings for grain, bleed, opacity and size. I should point out that Thick Paint is very different to the existing impasto types of brushes – you can press your brush down and literally pool the paint up if you so desire. Added in Painter 2017, the Texture Painting brushes allow you to add texture directly to the painting and can be manipulated with a range of transform tools. Painter 2018 adds a new range of brushes to this feature called Thick Texture brushes. These are added under the 2.5D moniker and add a level of impasto to the brush strokes used to add your texture. If you wanted scales, cracks or deep pores on a character you can use the Thick Texture brushes to add the texture and then alter the sense of depth via the directional lighting settings. You can adjust the position of lighting so that realistic-looking shadows appear. 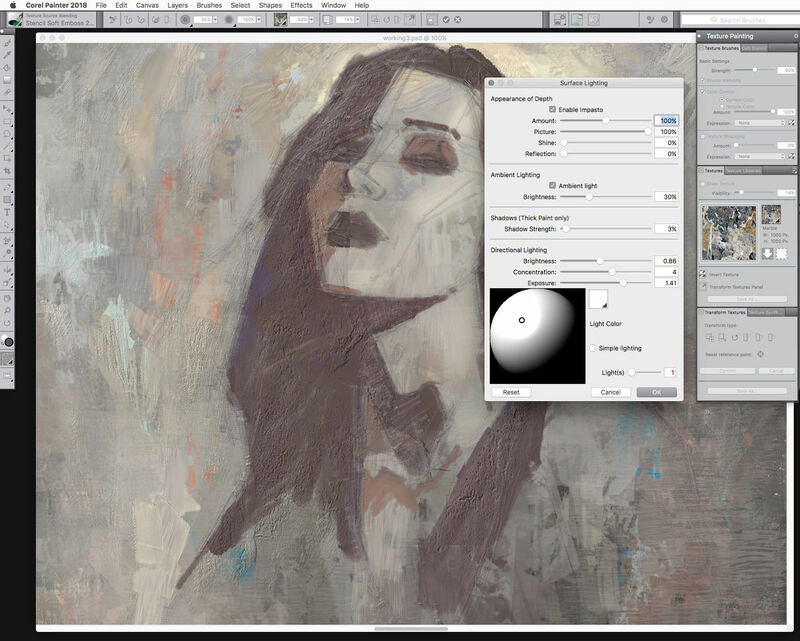 Primarily aimed at newcomers to digital painting – especially those transitioning from a traditional painting background – the new Natural-Media brush library gives quick access to a range of familiar brush variants with easily recognisable names and icons. This library gives a simplified range of categories: Hard media, Ink, Paint, Refining and Photo art – each of which contain some useful and recognisable brushes. For instance, in the Oils subcategory of Paint you will find good Filbert, Fan and round brushes, along with a few palette knife variants. For new users these are enough brush variants to get started and not become overwhelmed by some of the more complex options. 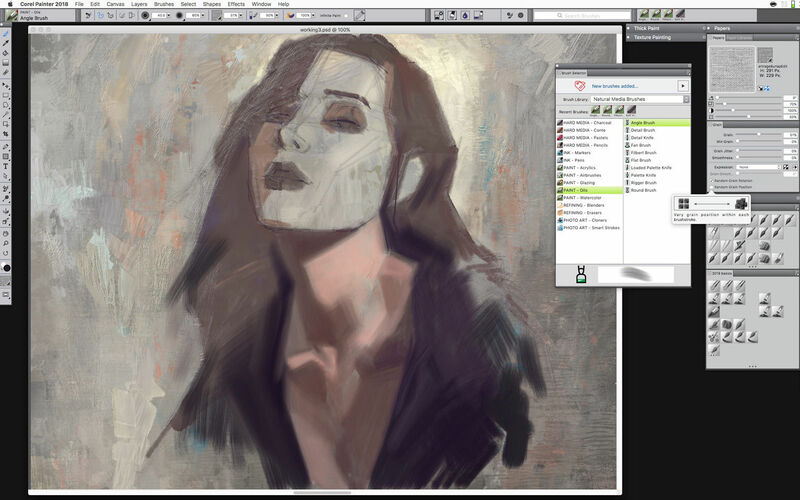 For seasoned Painter artists this new library is also a good way to create a nice minimal workflow. One of the problems that digital painting encounters is trying to produce brush stroke that appear completely realistic. There are lots of settings you can adjust to help with this challenge – stroke jitter, colour expression and variability immediately come to mind – and now there’s a new one. Painter 2018 has Random Grain Rotation and Random Grain Position options. These allow the paper grain to change a little with each stroke, randomising your brush marks and further reducing a ‘digital’ feel. These new settings can be applied to any brush that has a grain setting – so even older brushes can take advantage of the enhancement. Painter’s selection tools have always been a bit lacking. Fortunately there are are a new range of Selection brushes that help break away from the usual Lasso and Marquee way of working to approaches you might be familiar with from Photoshop. You can quickly make selections with a variety of new Selection brushes, including the Fractal Selection brush. Working in a similar way to Photoshop’s Quick Mask setting, this range of brushes now allow you to paint a selection that not only includes shape information but also transparency. A customisable semi-opaque colour overlay shows where you’ve painted your selection, from there you can add or subtract from your selection with ease. This is particularly useful when used with wet brushes – watercolours for example. Selections can be used like liquid masking to prevent the paint spreading. There’s a selection brush for Comic Book Flattening that uses an aliased edge, which is handy for colouring lineart. You can also use any stamp-based brush variant as a selection tool for even more flexibility. Texture painting for 3D models really relies on the size of the source texture you’re using. If you have a small texture file and want to paint it on a character or layer in a much larger canvas, you’re left with either having to scale that texture up or repeat it. With the new Texture Synthesis feature you can capture and generate an area of your texture or document and then reproduce it on a larger scale. Properties of the selection can be randomised, creating a new texture based on your settings and can be sent to a new layer or saved out as a reusable asset. I haven’t spent much time using it and while it can be a little tricky (and – depending on your document size – a little slow) to generate the texture, you can get a good seamless texture that uses the features of the original source. The Drip and Liquid technologies have been improved and now work on empty layers – previously they could only work on top of existing pixels. This means you can now use the brushes on a separate layer to do all your blending work, picking up underlying colour and keeping layers below intact. Impasto brushes have been around for a long time in Painter and have always been the go-to for creating strokes with depth. 2018 now allows for more compatibility with more brushes, so the recently added glazing brushes can now be used with an impasto setting to build up thin layers of paint that also build up depth. It looks like the Properties bar has been improved. More of the important settings have been added and there are additional fly-outs for each tool allowing you to minimise more of the palettes while you’re working. There have also been other performance tweaks under the hood and there is a noticeable improvement in the speed of brushes from 2017. Without a doubt, Corel Painter is still the best at replicating traditional media in a digital form. The Thick Paint brushes are the biggest improvement of the last few years and if you really want to emulate thick paint effects, this is a great version to pick up. However, if the Thick Paint isn’t something you’re interested in and you’re an existing user – particularly of 2017 – I’m not sure how enticing the upgrade will be for the price tag.